Sigh. I’m waiting. Patiently. My refrigerator has once again brought the temperature of the object of my intended review to a point that’s to cold to allow the subtle (or not so subtle) flavor and aromas to express themselves properly. I could use this time to go in and find the magic knob that controls the temperature and turn it down a click or two. But with my luck I would wake up tomorrow with a fridge full of stinky milk and tubs full of fungal experiments that used to by Tracey’s Greek yogurt. And I have a feeling she’d frown on that. Hard to believe, I know. But enough about how my appliances hate me. Back in October I reviewed Duclaw Brewing’s first brew in there H.E.R.O series, their chocolate peanut porter. Well the beer was so well received that Duclaw has decided to offer it as a regular seasonal. So I guess, really, that makes this review superfluous. I mean it’s the same beer, just in a different sized bottle and a catchier name. Sweet Baby Jesus. Why do I want to say it like an old southern maid? “SweeeEET BAby JESSUSSS!” Anyway, I guess I didn’t think this through. But I’ve already opened the bottle so I’ve committed. Took a photo and everything. So I guess I just have to do this. THEM: DuClaw decided not to mess with the beer (smart move), the grain bill is still pale, chocolate, crystal, black, brown malts; and roasted barley. Fuggles and Goldings hops balance out the beer at 53 IBUs and it still clocks in at 6.5% alcohol. ME: Nope, still to cold. Tracey is watching her usual Monday night shows. So is this girl finally the mother on H.I.M.Y.M? Isn’t this the show’s last season? We should be getting to see her pretty soon shouldn’t we? Guess I’ll just have to wait and see. So I was wondering, has the advent of brewers introducing peanut butter beers given those with peanut allergies one more facet of their life they must be careful in? Do those who enjoy DuClaw’s Venom fear for the day when under the Government Warning statement there will be a label that reads, “Food Allergy Warning! This beer is brewed in equipment that has come in contact with peanuts or peanut products.”? You know!! How horrible would that be? I mean, drinking sessions with your friends result in enough trips to the ER already, right? Huh? They don’t? Oh. Hmmph . Maybe I need new friends. Anyway, let’s get back to the beer. ME: Nope, still not there. Am I the only one who thinks Megyn Price from Rules of Engagement is cute? I mean, obviously Bianca Kajlich is supposed to be the hottie in the cast, but I’ve liked Megyn since she was in “Grounded for Life”. You know, that Fox Network comedy where she’s totally unbelievably married to Donal Logue? Yeah, like that would ever happen in real life. Anyway, where was I? Oh yeah, and how about bars? Will they have to carry epi-pens and benadryl on the off chance that someone orders a beer from a tap on which the previous beer was SBJ. What if the lines weren’t flushed properly? Will bars have to dedicate a “peanut butter tap” which is clearly marked? Will this once beloved product spokesman be reduced to nothing more than a warning sign? Obviously I’m being a little tongue in check here, but these type of food allergies can be the most sensitive and the most severe. One child in a Arkansas recently started an uproar when his mother sent him to school with a PB&J, unaware that the school had a ban on product, that had been enforce for six years, to protect those with allergies. 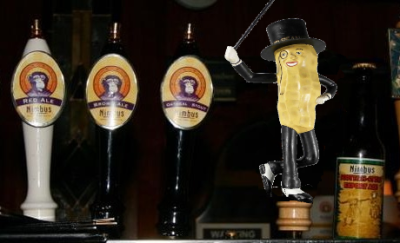 And since, as my friend Lisa loves to point out, “we are such a litigious society”, I await for the day when someone sues a bar because they were not informed that one of the beers on draft contained peanuts. ME: Finally. This beer is just awesome. You know, if someone would have told me about 10 years ago that one day one of my favorite beers would be one brewed with peanut butter I probably would have laughed at them. But I can’t lie, I love this beer. The aroma is a tantalizing mix of chocolate and peanut butter, with under tones of roasted grains and English hops. The nose serves as no slight of hand for the flavor, what you smell is pretty much what you get. SBJ starts with some nice grainy chocolate in the front, and then the peanut butter comes into play. There’s almost a reminiscence of some chocolate milks I’ve had in the past or maybe a milk shake. Did I ever have a chocolate peanut butter milk shake? I willing to bet I have. The peanut butter isn’t so in your face as to be stupid, instead it mixes well with the other flavors . I was getting something else just after the peanut butter, something I couldn’t quite latch onto. Maybe it was the hops, or something from the grains. The finish is clean, with just enough bitter to balance, but not to take the beer away from the what it’s intended to be, an ode to the sweet “you got peanut butter in my chocolate” that you enjoyed as a kid. And if you’re like me, probably never out grew. I think (as blasphemous as this may sound) that it might also make a great marinade. Or maybe a base for some kind of “peanut sauce”. I definitely could see either. Where did you find bottles of this? State Line in Elkton. I need to get more. Loved SBJ as well. Had it at our monthly BYOB beer shares, and we all said “Ssswweeetttt Babbbyy JESUS!” yum. You 2, me 0. Gotta get it. I know what I’m looking for on my next trip to State Line! If you should ever encounter Spring House Big Gruesome, you would probably enjoy that one as well! !